Most hockey players have certain routines that they go through before a game. Nashville Predators defenseman Michael Del Zotto is no different, but one of the things he does prior to a game stands out as a bit unique. Each game day, Del Zotto checks his phone to read a text message from his 12-year-old friend Liam Traynor. Liam was featured as part of HBO’s “24/7” series leading up to the 2012 Winter Classic game between the New York Rangers and Philadelphia Flyers. One of the documentary’s episodes profiled the special relationship Liam had with then-Rangers head coach John Tortorella. Mostly known for his crusty exterior and testy exchanges with the media, Tortorella showed a much softer side in his interactions with Liam, who is living with Cerebral Palsy. One of the scenes took place in Liam’s bedroom. He is shown maneuvering his wheelchair over to a Rangers jersey hanging on one of the posts of his bed. That jersey was Del Zotto’s number four. Not long after that, Liam attended a Rangers game at Madison Square Garden and went down to the team’s locker room after the game. Del Zotto brought his friend to the team bench where they spent the next hour discussing all of the things that happened during the game and where they occurred on the ice. 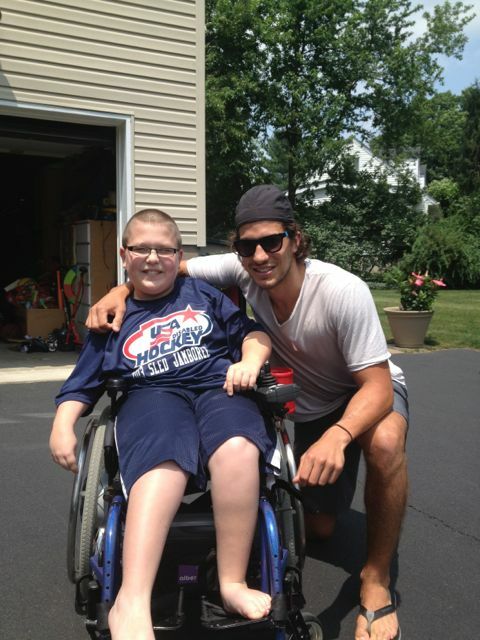 Following one of Liam’s surgeries, Del Zotto surprised his friend at the family’s Rockland County, New York home so that they could play Xbox together. One of the signs of a solid friendship is when one friend stands up for the other, and that’s exactly what Liam did during Del Zotto’s second NHL season when the Rangers assigned him to their American Hockey League affiliate in Hartford, Connecticut. Not happy with seeing his friend and favorite player sent down to the minors, Liam called Tortorella looking for an explanation. To his credit, Tortorella called Liam back and explained the process that teams sometimes have to go through with young players. An offseason coaching change in New York made the start of the 2013-14 season a difficult one for Del Zotto. In late January, the Rangers sent him to Nashville in exchange for longtime Predator blueliner Kevin Klein. Seeing his friend move close to a thousand miles away was difficult, but Liam has seen a dramatic on-ice change in Del Zotto early in his tenure with the Predators. Liam also noted the instant chemistry Del Zotto developed with Seth Jones, who Del Zotto was paired with when he first became a Predator. And as a sled hockey defenseman, Liam definitely knows what he is talking about. Knowing that Liam missed his friend, one of Liam’s fellow Ranger fans came up with the idea of starting an online fundraiser to send Liam and his family to Nashville to catch a Predators game. “When we saw the site, we were like, ‘Oh my goodness,’” Liam’s mother Deborah said. In just 11 days, the online fundraising campaign raised over $4,000, enough to cover all of the transportation and lodging expenses for the entire Traynor family (Liam, his twin sister Shannon, seven-year-old brother Kieran, and parents Deborah and Richard) to head south and reunite Liam with Del Zotto. Single donation amounts ranged from five dollars all the way up to $1,000, with all contributors electing to remain anonymous. “Once I saw that we got $2,000 up to $3,000, I kind of started realizing that it was getting real and it was going to happen,” Liam said. Since the Predators do not face the Rangers or the Vancouver Canucks, Tortorella’s new team, in Nashville again this season, the March 8 game against the Columbus Blue Jackets was selected as the target. Thanks to one Rangers blog, Liam will have proper attire for a game in Smashville. That blog sent him a Predators jersey, complete with Del Zotto’s name and new number. Liam says he can’t wait to get his friend to sign his new jersey. Since Ryan Ellis wears number four for the Predators, Del Zotto needed a new number. Del Zotto did not have too difficult of a decision to make; in fact, it was already made for him. “You can tell he has a lot of pull with me,” Del Zotto said with a smile. Thanks to a helping hand from the brass at 501 Broadway, Liam and his family will have their seats at the game upgraded. They will sit in the suite that Pekka Rinne and Shea Weber purchase for each home game, usually for use by families going through some difficult times. Still a diehard Ranger fan, Liam is now a big supporter of the Predators as well. “His room is painted all in New York Rangers’ colors and theme, but now he says he wants to paint the other half the Predators’ colors,” Deborah said. Liam has been doing some walking on the treadmill lately. He documents the workouts and sends the video to Del Zotto. With the Traynor family set to be in town for the game on the 8th, Del Zotto’s pregame routine will be a little different. He won’t have to check his phone for words of encouragement from Liam. He will be able to get them in person. Great article Jim! It’s these types of stories that inspire others to give of themselves and remind us of what is really important in life. Love the new site, glad to see a new outlet for your excellent writing.